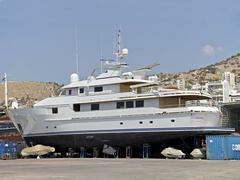 Talking to Fergus Torrance of Titan, Hyde & Torrance, he tells me that the asking price of his refit project, Picchiotti's 38.7m superyacht _Tamarindo _has been cut from €1.695 million to €995,000. This new price will also be the 'offers over' figure for a sealed bid auction on November 27th 2009.Tamarindo is in the early stages of a complete refit project, having had her entire interior stripped out and now offers a new owner the opportunity to complete the fit out to his own tastes. Originally offering space for 10 guests in five staterooms, she was built by the Italian yard in 1987 and brought up to MCA standards by Pendennis in a 2006 refit.